We had been a little lax in publishing our comments – but we are picking this up again. We have a lot of new products, as well as some interesting sales coming up. We will let you know soon. Here are a few photos from our Goldenteak brand furniture, in an urban setting. Teak furniture is not simply for suburban decoration… it can perfectly accent your city home, as well. 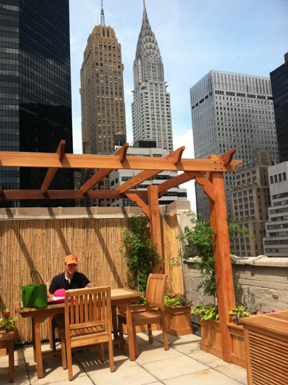 The teak furniture in this NYC urban garden creates a comfortable lunch spot. This bench, part of a Boston urban garden, provides a convenient place to sit when traveling! This urban garden creates a picturesque area for relaxation, complete with the beautiful Empire State building skyline in the background! 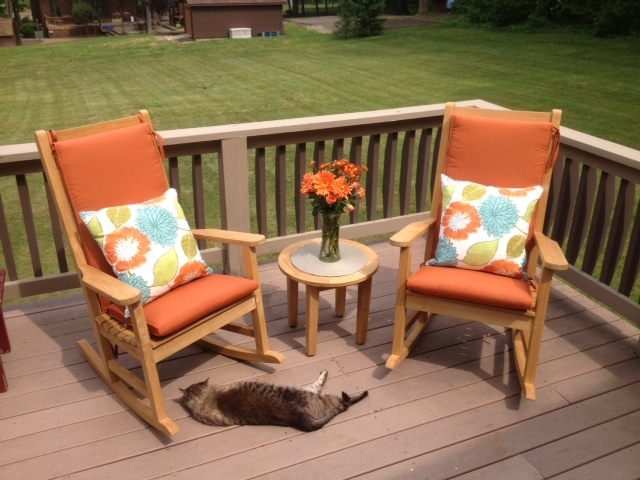 Check back for more customer-submitted photos of our furniture usage! 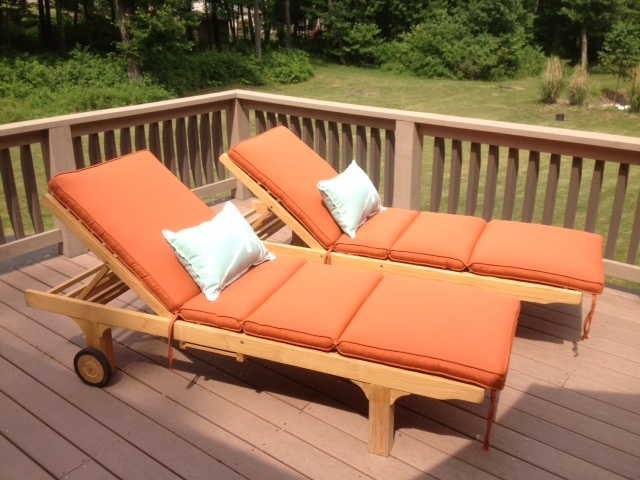 This post covers one customer’s submission of Goldenteak’s products in use! All pieces of furniture share a similar cushion color scheme and create an appealing home decor. The hearth and patio chest displayed below hinges open to store your items, and can be used as a comfortable spot to sit. The teak chaise sunloungers offer an adjustable reclined position, and have wheels to allow easy rearrangement within your patio area. These chairs are pictured without arms, but are available with arms as well. 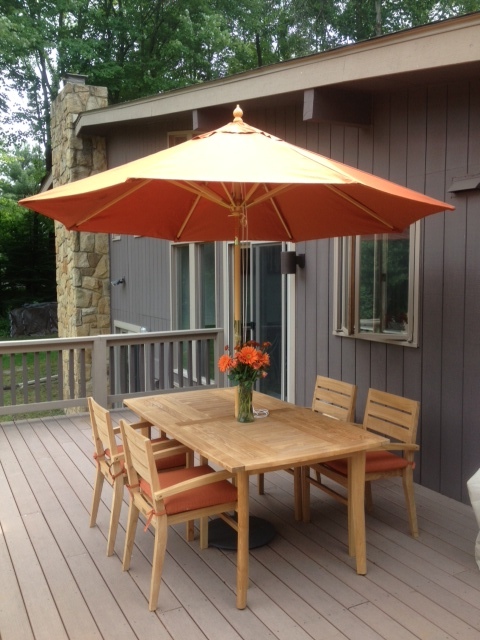 The teak Sutton rectangular table and Ventura stacking chairs (with arms) fit comfortably on the deck. Perfect for a summer dinner enjoyed outdoors! 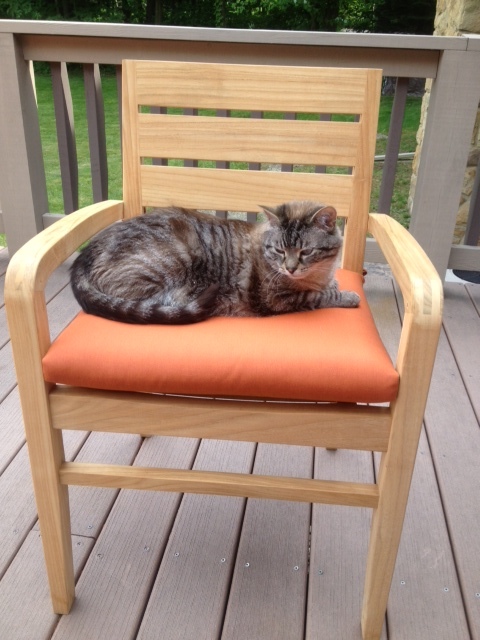 The cat seems to be enjoying the Ventura chairs, too! 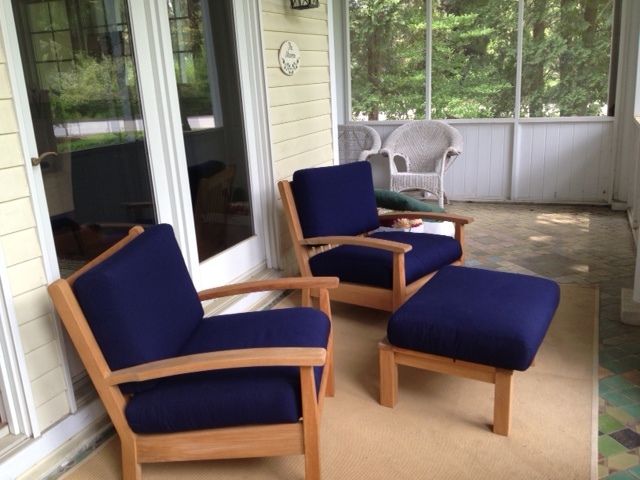 The customer also purchased a pair of teak rocking chairs to complement the rest of the deck furniture. A classic, elegant way to decorate your home. Please call us with questions at 978 689 4041! Goldenteak’s beautiful teak benches are now on sale through March 14, 2010. Choose the handsome Marlboro Lutyens bench available as either a 2-seater or 3-seater or select our teak Boston benches, teak Chippendale benches or the popular teak Aquinah benches. Our teak benches are made from Premium Grade A plantation teak wood. Whether you are looking for a bench for your back yard, your vacation home or to furnish your workplace, Goldenteak has the teak bench to fit your needs. Plus if you order today, your beautiful benches will qualify for free shipping. Call now at 978-689-4041 or visit our website at www.goldenteak.com. Our sale on our teak benches ends March 14, 2010. Before we know it spring will be here. 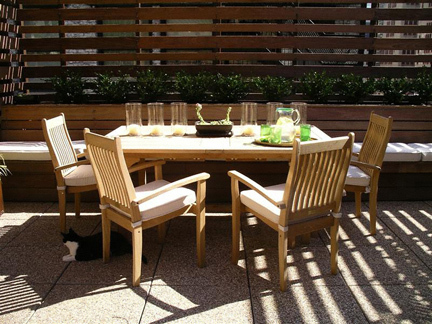 Now is a great time to save a considerable sum of money on your outdoor teak furniture needs. All extension tables are on an additional 20% off until Feb 1, 2010. Goldenteak tables are solid, well made, grade A plantation wood. The tops of the tables are thick, the hardware is all brass, the legs have additional center support to prevent movement. A goldenteak table will be a piece of furniture that will last for many decades and beyond.